Your comfort zone is a behavioural space where your activities and behaviours fit a routine and pattern that minimises stress and risk. It provides a state of mental security. You benefit in obvious ways: regular happiness, low anxiety and reduced stress. It’s easy, as a person with a stutter, to sit back and allow others to speak for you, avoid situations in which you think you may have trouble speaking ... "I can put that phone call off until tomorrow, I don’t really feel like making it now, I don’t feel like I will have any fluency control. I want to watch this program I’ve been looking forward to." Does this sound like you? 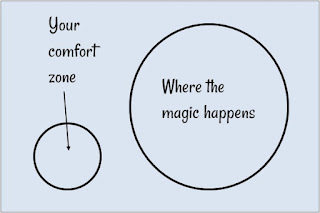 Do you prefer to just stay in your comfort zone? It’s great to be relaxed and not have to worry about the busy world and all its expectations. We all deserve timeout. However, it’s not good for us psychologically to avoid and continue to avoid all that we perceive to be confronting situations. Consider this quote by Pandora Poikilos: "We are so accustomed to the comforts of "I cannot", "I do not want to" and "it is too difficult" that we forget to realize when we stop doing things for ourselves and expect others to dance around us, we are not achieving greatness. We have made ourselves weak." On a recent radio program, a young psychologist speaking about avoidance and comfort zones said that people who reside in their comfort zones tend to be the unhappiest of all. We all know of the great human potential to strive and succeed ... the first step comes from YOU. Manoj Arora said, "Coming out of your comfort zone is tough in the beginning, chaotic in the middle, and awesome in the end...because in the end, it shows you a whole new world!! Maintain the feeling of fluency with some hard work, then step out and enjoy! *Ezy-Speech TV Episode 6: You are the Key to Fluency Success relates to this topic. I CELEBRATE STEPPING OUTSIDE OF MY COMFORT ZONE. A whole new world awaits me as I courageously travel out of my comfort zone. "The science-based Ezy-Speech Program is a cleverly-designed program for stutterers developed by recovering stutterers, a speech pathologist and psychologist. The all-encompassing program is user friendly and equips the stutterer with all the necessary tools to maintain fluency on a day-to-day basis and, in fact, in every speaking situation, even at public occasions. I use the technique every day now, and it has become second nature. I sound wonderful and, more importantly, I feel wonderful. It gives me great control and confidence. It's amazing! The program was fantastic as it emphasised the importance of understanding the psychological patterns and behaviours associated with stuttering. The Ezy-Speech program is unique as it provides the opportunity to work one-on-one with a speech coach in real time using Skype. This enabled me to gain confidence and to practise thoroughly and refine my speech technique. With that personalised coaching, and your own dedication and persistence, the Ezy-Speech program will definitely work for you as well as it did for me! The program has given me so much confidence and control in my speech, that I have recently joined Toastmasters and I'm now competing in speech competitions!" "Ezy-Speech is a comprehensive and complete program that fully supports a sole Speech Pathologist. Not only is the speech therapy part easy to achieve, the cognitive aspects for fluent speech in life are explained. The holistic team approach is great!" Copyright 2010 - 2019 Ezy-Speech. Simple theme. Powered by Blogger.